Week 8 provided another chalky week, allowing PFF Greenline to pick the winner in 11 of 13 matchups. The upshot of such events is that we still know that the Rams, Saints, Patriots and Chiefs are good and that the Browns, Giants, 49ers, Cardinals, Bills, Raiders and Jets are… improving. The middle continues to be the middle, with some opportunities (e.g. via the Steelers/Ravens game) for teams to differentiate themselves this week. The Rams needed all 60 minutes and an error on the part of their opponent to beat Green Bay, but were able to move to 8-0. They are currently a 95.2% proposition to win their division, but a big matchup with the Saints looms for the number one seed (one where we have the Saints favored). Saints are a classic case of “don’t overreact to Week 1 (or 2)”. They have won six straight, including the last two on the road against teams that felt they were on the cusp of competing for the upper echelon of the NFL. If they win this week, you’d have to consider them the frontrunner for the NFC moving forward. Tom Brady has not been as brilliant as he usually is (we would have him as a cluster three or four quarterback so far), but the Patriots continue to hum as a unit. James White has been a top-five back in the league, averaging a big 2.00 yards per route run through the season’s first eight weeks. Sunday was historically a game that the Chiefs lost in the past, and they did not play well against the Broncos – surrendering 189 yards on the ground, 112 BEFORE contact. Be that as it may, they won comfortably, and are an 88% proposition to win their division, despite the team below them in this ranking. The Chargers took last week off after a close win against the Titans in London. They remind us of a Rams lite, leading the AFC in early-down efficiency passing the ball while being second in the conference in early-down efficiency running the ball. If this continues, they will be scary moving forward. Well, well. After a slow start – including a home loss to Baltimore, the Steelers are back to being the frontrunner in the AFC North, with more than a 60% chance of winning the division. 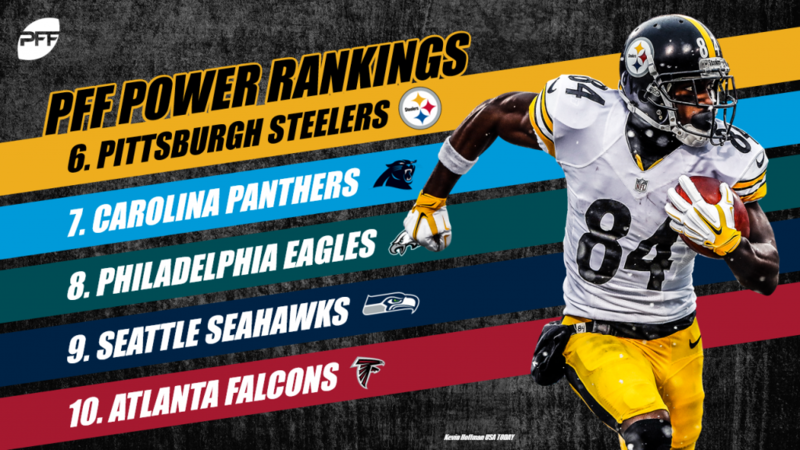 While Big Ben has his lowest PFF grade since 2006, their offense has picked him up – meaning that if he reverts back to his mean, they could be a contender moving forward. While at 5-2 (and a win as our lock of the week against Baltimore on Sunday), the Panthers are a 17-point comeback in Philly and a 63-yard field goal away from being 3-4 as well, tempering our enthusiasm for them a bit. Their offense has been great under Norv Turner (one of only two teams with > 0 EPA on both early-down runs and passes), meaning that their chances of competing with New Orleans have never been better. 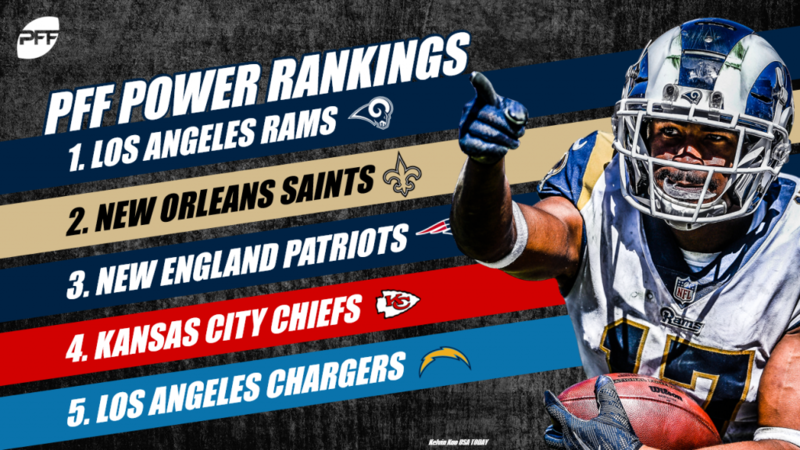 The Eagles are still getting a lot of love from our priors, which had them as the number one team going into the season. 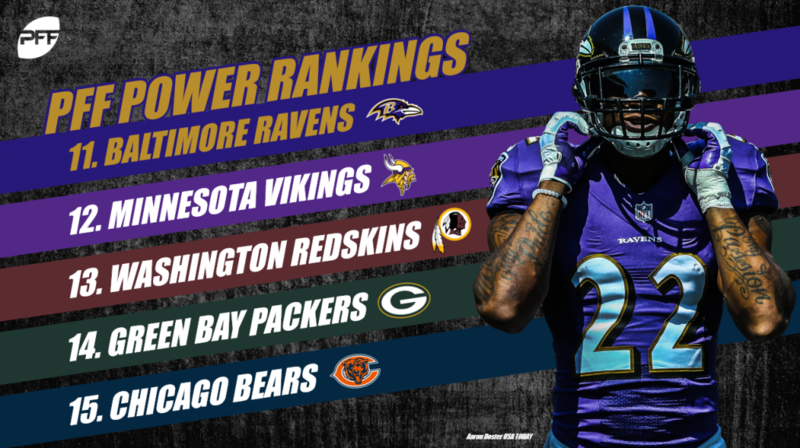 They are still performing well in many areas – including being a top early-down defense despite a lot of injuries in the secondary. In many ways, Carson Wentz is playing better than a season ago – as he is limiting his negatively-graded plays to fewer than 10% of his dropbacks this year. When we were one of the few places to project the Seahawks at over eight wins, we were a bit nervous, given the gnashing of teeth over defensive defections and their new offensive coordinator. While their schedule gets more difficult moving forward, Russell Wilson and company have a better than 50/50 shot at making the playoffs after missing the show in 2017. Speaking of priors, we seemingly can’t quit Atlanta. While one could argue their early-season schedule was easier than most (with five home games), there is a path to 6-4 for this bunch as they head into their rematch with the Saints in week 12. Matt Ryan is playing as good as anyone right now, generating 0.28 EPA per dropback through seven games. Defense doesn’t win championships, or even mid-season games, in today’s NFL. The Ravens’ last two games have gone about as bad as anyone could have imagined – surrendering a 10-point lead to the Saints and, after getting out ahead of the Panthers, allowing 36 points on the road to Cam Newton and company. At one time the playoffs seemed like a lock for this bunch, but with a loss to the Bengals and difficult showdown this week with the Steelers, we have them with less than a 50/50 shot at making it come January. If you watched the Vikings game against the Saints, it was hard to come away from that affair thinking the Vikings weren’t one of three or four NFC teams capable of winning the conference. Adam Thielen is the league’s most valuable non-quarterback in terms of W.A.R., their defense allowed fewer than 150 yards passing to Drew Brees, and Kirk Cousins, save for a few plays, was able to deliver the ball despite substantial pressure from the Saints defense. They are the favorites to win the NFC North at this point, which would be their third time in four years. It was a sweat, but our PFF Greenline pick of Washington over New York was one of the better of the weekend. Their defense has been one of the league’s best, surrendering early-down success on fewer than 47% of passes and 39% of runs, despite having played the Packers, Saints and Panthers so far this year. If Alex Smith can make a few more plays in the passing game, this team should be the favorite for the NFC East. The Packers missed a golden opportunity last week in LA, where they could have taken my advice and given one of the best quarterbacks in the game a chance to win it outright, but returned a kickoff instead. This week they travel to New England, and will most likely fall to 3-4-1 as a result. We have their playoff odds at about ⅙ a result, meaning that we might see some changes in Titletown come this offseason. Imagine how much different this season looks if the Bears pull off the upset Week 1 in Lambeau instead of losing by one. Even then, they sit above 0.500, almost surely surpassing their Vegas win total of six heading into the season, and with a greater than 40% chance of making the playoffs. Mitchell Trubisky has as many negatively-graded throws as positively-grade ones, so that will have to improve if they are to make some noise, but look out for Chicago. While the NFC East appears to be Washington’s (and Washington beat Dallas) you won’t find a better opportunity for a middle-of-the-pack team than you have here in Dallas, with their 9% chance to take the thing home. In terms of efficiency, they’ve been a top-five team in the NFC defensively, so if Dak Prescott can improve (they are averaging -0.07 expected points added each time he drops back to pass), they should be able to compete in a down NFC this year. Take one look at PFF Greenline, and you’ll see the Titans as 6.5-point underdogs on Monday in Dallas. That’s a pretty big slap in the face from the market that didn’t respect them very much at 3-1 either. Marcus Mariota is healthy now, and he’ll have to live up to his billing as the former number two overall pick if they are to improve a passing offense that is generating -0.05 EPA per early-down pass play. This is a weird one because we have Cincinnati as the team with the highest odds to earn the sixth seed in the AFC. But, like Tennessee last year, that doesn’t necessarily mean we think they are a good team. The Bengals are on pace to give up the most yards in the history of the league, and while Andy Dalton and his 6.0% big-time throw rate has played well, we need to see more than some fluky wins from the hometown team to buy into them moving forward. 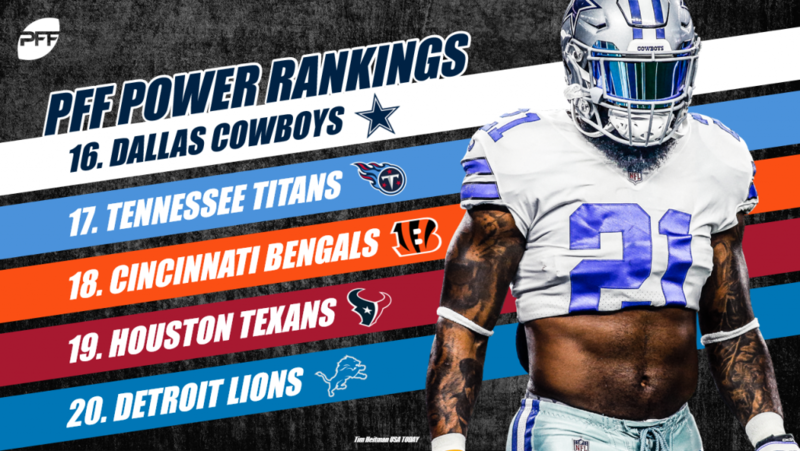 The same things we’ve said about the Bengals apply to Houston, who has leveraged a pretty easy schedule to a 5-3 record and a spot atop the AFC South through eight games. Getting Demaryius Thomas and a week off will certainly help Deshaun Watson, who has generated a positively-graded play on a larger percentage of his dropbacks than anyone other than the two Tampa Bay quarterbacks. Just when you think the Lions are onto something, they lose by multiple scores at home to a plucky Seattle team – and then trade one of their best players to the Eagles for a third-round pick in a sign that they are not sure they can contend in an even NFC North. They’ve never lost in US Bank Stadium, but go into this week as -4.5-point dogs with their chance to win the division (standing at 11.5% now) almost wholly tied to taking down Kirk and Co. Buckle up. 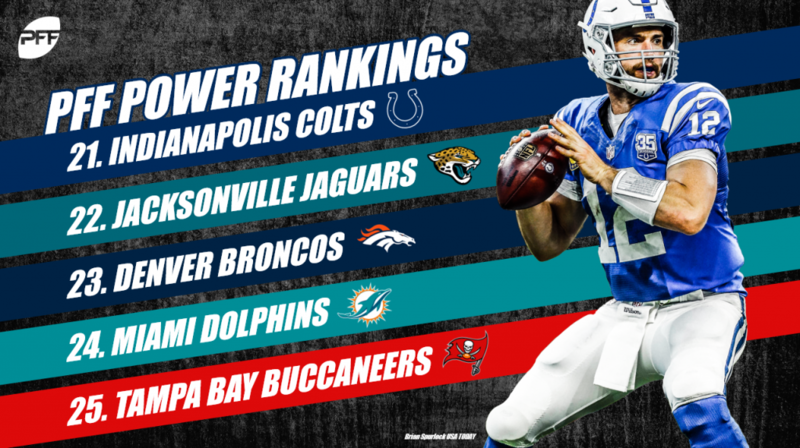 The biggest darkhorse among teams in the bottom part of this ranking system has to be the Colts. At 10.3% to win the division, they are clearly long shots. However, with three home games coming up after their bye, they could sit at 6-5 with just five games left to play in a division that is… improving, to put it nicely. Andrew Luck has had a nice comeback year to this point – if he can continue to decrease his turnover-worthy plays (now sitting at 4.2%) that offense could be dangerous. The Jaguars settled for two field goals in the fourth quarter and eventually fell to the Eagles in London. They head into their bye hoping to fix the defensive issues that have plagued them in 2018. Jalen Ramsey had his best coverage game in 2018 and will be the key to a defensive turn around if it occurs in the second half of 2018. Dante Fowler Jr. was shipped out of town at the trade deadline, opening up some extra snaps for rookie first-rounder Taven Bryan along the defensive line. The Broncos cleared space for their up and coming receivers by dealing Demaryius Thomas at the trade deadline. Thomas will now return to Denver this weekend wearing a Texans jersey in a game where PFF greenline likes the over. Courtland Sutton should see an uptick in routes run, but it won’t matter who is playing wide receiver if Case Keenum continues to struggle. In 2018, Keenum has a higher percentage of turnover-worthy throws to big-time throws, one of only six starting quarterbacks to, unfortunately, have this designation. Brocktober ended with a thud as the Dolphins completely fell apart on the road against the Texans. Ryan Tannehill has begun throwing again but neither of these quarterbacks on the current roster appear to be the solution for the Dolphins. Devante Parker was the lone bright spot for the Dolphins in week 8 posting 3.44 yards per route run. The Bucs head to Carolina to square off against the Panthers with Ryan Fitzpatrick back at quarterback. The Bucs are in a very tough spot with a talented roster but an aging journeyman quarterback and a former #1 overall pick who just isn’t going to work out in Tampa. Fitzmagic offers significantly more deep passing potential and has posted a passer rating of 137.9 on deep passes in 2018 compared to Winstons 45.3 rating. The Jets couldn’t get anything going offensively and fell to the Bears on Sunday. Heading into week 9, they are three-point dogs to the Dolphins on the road. 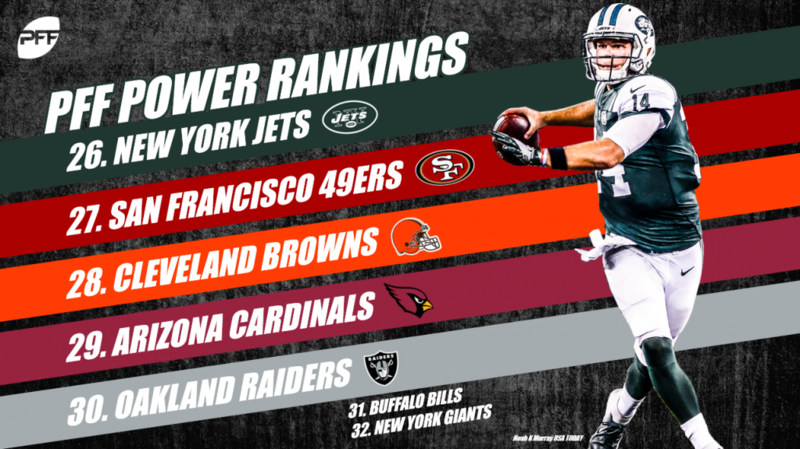 Our PFF Greenline pick likes the Jets to cover. Sam Darnold has been better as of late with only 2.4% turnover-worthy throw percentage compared to 6.3% in his first four games. After blowing a fourth-quarter lead on the road, the 49ers head into Thursday night as three-point favorites over the Raiders. Our PFF Greenline pick sides with the Raiders covering, as C.J. Beathard has been atrocious, especially of late, posting an EPA generated per pass attempt of -0.17, tied for second-worst in the NFL. The Browns finally cleaned house, albeit in the middle of the season, by firing head coach Hue Jackson and offensive coordinator Todd Haley. They have to find a coach who is capable of continuing the progression Baker Mayfield has shown. Mayfield has flashed at points and currently has the third best big-time throw percentage in the NFL. The Cardinals rallied with 15 fourth-quarter points and clipped the 49ers at home for their second victory in 2018. They head into their bye needing to build on the fourth quarter play of Josh Rosen. Among starting NFL quarterbacks, Rosen has the lowest EPA generated per pass attempt at -0.24. A week after jettisoning Amari Cooper to Dallas, Derek Carr had one of his better weeks targeting the wide receiver position. Despite recording only a 50% completion percentage, Carr had a passer rating of 132.3 on throws to receivers. Jared Cook continues to be the key for this receiving unit, posting the third-highest PFF receiving grade among qualifying tight ends. The Bills kept the Patriots out of the end zone for three quarters on Monday, but journeyman Derek Anderson wasn’t able to generate any semblance of offense. It is now Nathan Peterman time with dark days on the horizon for the Bills Mafia. For the second time in three weeks, Eli Manning had three turnover worthy throws with two resulting in interceptions. Despite dynamic play from skill position players, the Giants simply cannot win consistently with Eli at quarterback. At this point, hope for the Giants rests with securing the #1 overall pick and a shot at their future franchise quarterback.